Jello shots are incredibly popular and lots of fun, provided they don't get into the wrong (under-21) hands. There are a zillion possible ways to combine jello, juice, food coloring, and alcohol; some are basic while others take real skill. One of the few downsides of jello shots is that most of the time, they're served in cups—without spoons. This makes it very tough to enjoy your shot gracefully. One way to get around that problem is to serve the shots in something a little easier to shoot the jello from. In the summer, it's a lot of fun to use fresh fruit as a mold for jello shots, making it easy and fun to consume. 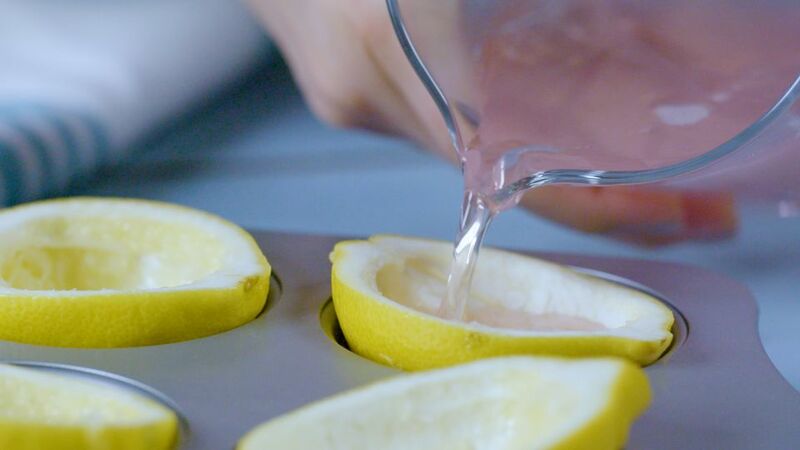 Using lemon wedges as a mold, these four-ingredient jello shots are impossibly easy and super impressive for potlucks and parties. Make sure to chill these for a minimum of four hours (though overnight is ideal), as they will be much easier to cut and hold their shape. Cut the lemons in half. Using a paring knife and spoon, carefully hollow out the insides. Add the lemonade to a pot or deep pan and sprinkle the gelatin over the juice. Let it sit for 2 minutes to "bloom." You’ll see a ripply film form on the top. Place the mixture on low heat. Heat and continually whisk until the gelatin evenly dissolves, about 2 to 5 minutes. Be careful not to let the mixture come to a boil. Remove from heat and let cool a bit. Stir in the vodka. At this point, you can also add a few drops of pink food coloring to get a deeper pink color. Place the lemon halves face up in a muffin tin. Pour the mixture into lemon halves. Refrigerate until set, 4 to 24 hours. Carefully cut the lemons into wedges and serve. Experiment with different types of vodka. Many of the fruitier flavors go well with lemonade and can create a unique "signature" shot. For an especially beautiful platter, use a variety of citrus fruits including limes and oranges along with your lemons. If you like, it's easy to use green and orange food coloring to create a rainbow of fruity shots.